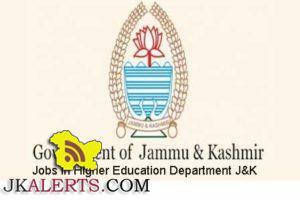 Jobs Higher Education Department vide order No 78 HE of 2018 Dt: 08-02-2018 online application form along with online payment of Rs 100/- are invited from the eligible candidates for engagement of Lecturers/Librarians PITs and Teaching Assistant / Assistant Librarians/ Assistant PTI’s on Academic Arrangement in Govt Degree Colleges of Jammu Division for the Academic Session 2018-19 in the following subject. The filling of on-line application form will stun from 18th June 2018 and ends on 7th July 2018 at / 2:00 PM. 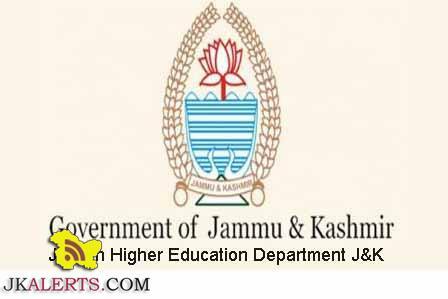 The online application form, guidelines and other terms and conditions issued by Higher Education Department of J&K Govt, for eligibility are available on the college website. Take out the print of application form, go through It carefully and check whether all the information furnished by you is correct. ❖ Again take out the print of application form and submit the same along with self attested relevant documents at the time of counselling in the Old Hall of G.G.M Science College. Jammu as per counselling schedule which will be uploaded on the website later on. In the event of any information being found false. Incomplete, incorrect, forgery. tempering of any documents then the candidature of the candidate will be cancelled without any notice thereof. Further, misleading information shall also attract necessary legal action. The candidates who possess degrees from outside J&k A State University are directed to bring bonafide certificate from the concerned universities.